Templates are often passed off as web design and they're not. A template is an already done for you (and thousands of others) website with all the blanks filled in for you. Do you know what you end up with with a template? A cookie-cutter website that looks like thousands of other websites. The worst part is that because your website looks just like thousands of others it will also perform like thousands of others. How are you supposed to compete when you're in the same position as thousands of others? We don't mess with templates ever. We only build websites 100% custom for you so you don't look like everyone else and you're not competing like everyone else. 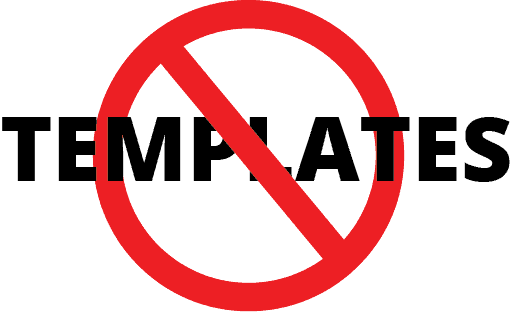 If you believe templates are deceptive to businesses and harmful to web designers, you're welcome to use the no templates icon. Show that you do your work custom and believe in true web design. We believe in unique art rather than mass produced "art".